Sure, Saudis (for example) don’t want to see a complete meltdown in Egypt. But… a partial meltdown that spurs the price of oil to new yearly highs? I bet it’s a welcome site for some. Considering the $10 jump in prices, Saudi Arabia is pocketing an extra $70 million a day — that’s real, hold-in-your-hand cash from perceived disruptions. How’s the saying go? If you can’t beat em, join em? Well, in the global oil patch it looks like OPEC is getting its way. The price of oil found its latest round of support above $100. Indeed, even with the best of intentions, and data(! ), your editor’s forecast for a drop in oil prices is still a ways off. In short, there’s still a load of fundamental reasoning that says the oil market is well supplied and prices are due for a short-term pullback. But rationale be damned! Another round of the Middle East effect, this time in the form of an Egyptian revolution, has taken prices on a rocket ride above the psychological $100-mark — a first for 2013. Last time Egypt showed its penchant for revolt prices jumped even higher. That was back in early 2011 and oil prices rallied to $113 a barrel. Regardless of the reason for the rise, prices aren’t likely to plummet in quick order. For example, following the price action for 2011, it took nearly six months for prices to find the bottom of the trough — in October of that year prices fell to $75 a barrel. For prices to start heading substantially lower we’ll need a fire brigade to put out the flare-ups in the Middle East — namely, Egypt and Syria. As you would assume, those are tough blazes to battle. Meanwhile, there’s still a safe way to play this bump in oil prices. Back in 2011, I gave you some insight that still rings true today. So you see, while a social revolution was flaring up in the Middle East, a technological revolution was getting underway here in the states. The timing of America’s energy revolution couldn’t have been better. At a time when oil prices were creeping higher and our economy was trying to dust itself off — a domestic supply of safe and affordable oil was a welcome site indeed! Here in the summer of 2013, Egypt’s revolution is flaring back up and America’s energy revolution is in full swing. And with $100 oil flashing across our screen, there’s several ways to play this scenario. Grabbing a handful of domestic oil producers is your best way to play this situation. You see, just as OPEC gains when the price of oil shoots above $100, so do domestic oil producers. Each day over $100 or in the high-90s allows domestic producers to increasing their margins. Increased margins and cash flow, as we’ve seen so far this year, will increase share price and allow companies to continue paying substantial dividends. Two years since the first Egyptian revolt, U.S. oil producers have truly hit their stride. Efficiencies are kicking in and breakeven prices for U.S. oil are headed lower — places like North Dakota’s Bakken and Texas’s Eagle Ford and Permian Basin are booming! That is, while in 2011 the verdict was still out for the profitability of U.S. shale oil, today we know that efficient producers can make a killing. 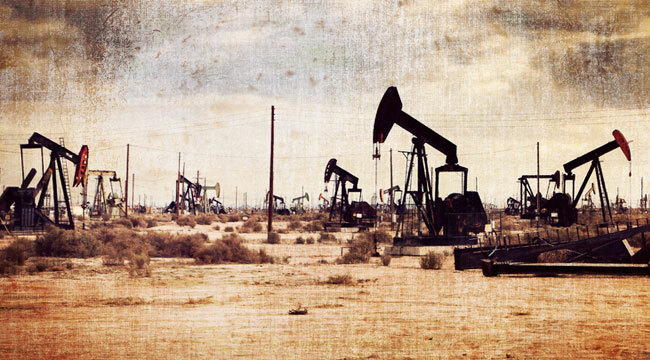 Lower drilling costs, shorter drill time, ample carry away capacity, downstream markets for natural gas liquids (NGLs) and various other factors are leading to a lot of opportunity in America’s oil patch. Getting your piece of the action is easy too. The same big players that we talked about in 2011 — Chevron (CVX), Exxon (XOM) and ConocoPhillips (COP) — all offer a slow and steady way to play this boom. Every day with oil over $100 is icing on the cake for these producers — better yet, even with a pullback these far-from-marginal producers will still turn a profit.